Course Outline | Technology Training, Inc.
For Whom Intended This course is intended for personnel involved in metrology, instrumentation and various testing activities. It is designed to provide a basic understanding of the methodology of calibration of measuring and test equipment. Brief Course Description The course commences with an introduction and review of some basic terminology, then covers systems of units, measurement standards, traceability and types of error. The course then covers calibration standards and documents such as ANSI/NCSL Z540 requirements and ISO 9000 and ISO Guide 17025. The use of techniques as “virtual” standards is discussed. A review is made of statistical analysis and uncertainty analysis, distributions and explanation of common definitions and notations used. Technical requirements in calibration procedures are covered, with content requirements. 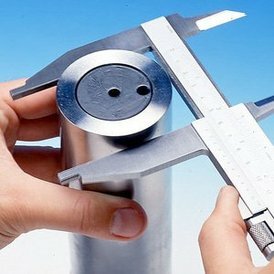 The course then covers calibration equipment and techniques in detail, starting with a discussion of mass and weight, including types of weighing devices and mass measurement techniques. Dimensional calibration is covered next, with precision instruments such as Vernier and digital calipers, height gages, micrometers and other devices. This section also covers measurement of force, torque, viscosity and hardness. Next comes a unit on fixed gauging, including Go and No Go gauging, and a detailed discussion of laser interferometry applications in calibration. Physical standards are discussed in detail, starting with reference planes such as surface plates and optical flats, and moving on to gage blocks, linear measurement devices, comparators and high-precision cylinders. The discussion of calibration of angle measurement devices includes autocollimators, theodolites, levels and inclinometers. The calibration of cylindrical rings, internal cylinders, thread gages is covered next. Other geometries and dimensional nightmares such as cylinders, threads and spheres are discussed. The course concludes with a discussion of the requirements of ISO Standard 17025 as they apply to calibration laboratories. The instructor presents the course aided by overhead transparencies. Students are expected to participate in classroom discussion and exercises. Diploma Programs This is a recommended elective in TTi’s Metrology/Calibration Specialist (MCS) Diploma Program and may be used as an optional course for any TTi diploma program. Prerequisites There are no definite prerequisites, but TTi’s courses Electronics for Non-Electronic Engineers, Metrology Concepts and Instrumentation for Test and Measurement would be helpful. Text Each student will receive 180 days access to the on-line electronic course workbook. Renewals and printed textbooks are available for an additional fee. Course Hours, Certificate and CEUs Class hours/days for on-site courses can vary from 14-35 hours over 2-5 days as requested by our clients. Upon successful course completion, each participant receives a certificate of completion and one Continuing Education Unit (CEU) for every ten class hours. Click for a printable course outline (pdf). Cylinders: Wires, Plugs, Pins, etc.